The author’s daughters take in sunset by the marsh. 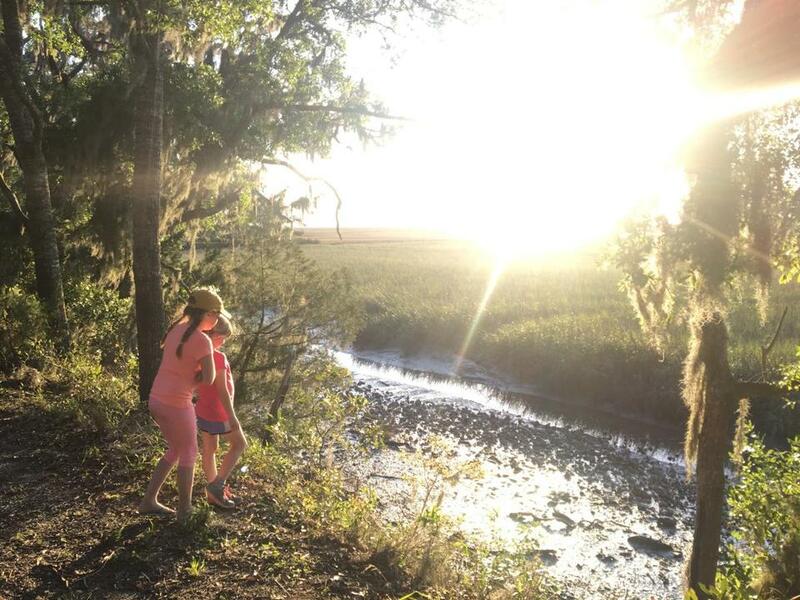 It was after we bicycled out of the marsh, and rolled into the dappled shade beneath the live oak trees, that a kind of magic took hold of my daughters. They had pedaled along fairly happily until then, complaining once or twice about the 80-degree heat (a sentiment I swiftly rejected as unacceptable). But now, coasting through an enchanted landscape, under overspreading branches draped with Spanish moss, their reverie turned otherworldly. They began singing, a song I didn’t know, and greeting every tree they passed with a cheery hello, like a pair of wood sprites cycling through a fairy tale. Birds sang, sunlight filtered through the trees, and for a while we roamed in perfect, shared contentment. It was probably just the shade that made them happy, but I couldn’t help but wonder: Had the oaks, these forest wizards, cast a spell over my children? It had been more than 20 years since I first found Jekyll Island, and was first transfixed by those massive, mysterious trees. Returning there in April, now with two children in tow, I wondered if it would be as I remembered it — idyllic and unscathed, with a touch of wildness. Our destination was slightly offbeat, adding to its appeal. Georgia borders Florida and boasts a similar climate, but it remains distinct, with richer and more concentrated Southern flavors. Its relative obscurity — at least among New England families planning their April vacations — means few crowds and lower prices. Direct flights to Atlanta, purchased three months in advance, were $200 apiece, and basic hotel rooms on the island can be had for less than $200 per night. We planned a stop in Savannah, another intoxicating Southern beauty I had loved long ago but hadn’t seen in years. The rolling red clay hills along the highway brought back memories of another time: my first job as a daily newspaper reporter, in the 1990s, in a tiny bureau in north Georgia. The sheriff called me “little lady”; the go-to snack was boiled peanuts. I was born and raised near Boston, so my knowledge of the South was based entirely on fiction: Faulkner, Capote, Warren, Lee, McCarthy, O’Connor. I set out to explore, traveling with my new reporter friends on weekends. There were languorous afternoons in the angsty, atmospheric bars of Athens, and an impromptu campout near Savannah, the night before its famous St. Patrick’s Day parade. Revisiting Savannah two decades later, I found it even lovelier than I remembered. We arrived just in time for lunch, and sat outside at Blowin’ Smoke Southern Cantina, on the outskirts of downtown, where the canopy of actual green leaves, after six months of bare branches, was as shockingly delicious as the ribs and brisket tacos. Afterward, we wandered euphorically from square to square in the exquisite city center, collecting bits of history like shiny coins. Down by the river, across from a Wonka-esque candy store where we stocked up on chocolate pralines, a street vendor named Chris deftly wove us perfect roses out of palm fronds. Then it was on to Jekyll Island, an hour south, with its wind-twisted trees and wide open beaches. Protected as a state park in the 1940s, and wholly owned by the state of Georgia, the buildable land on the barrier island is limited by law to roughly 35 percent, according to the Jekyll Island Authority. Ten miles long and a half mile wide, it has eight hotels and about 1,000 full-time residents — far more than federally-protected Cumberland Island, to its south, but fewer than the other so-called “Golden Isles” along the Georgia coast. The last, eastward leg of our drive to the island, across a great marsh, made for a spectacular introduction. The grasses glowed green and yellow, even pinkish, a vast coastal prairie ablaze in the afternoon sun. The open landscape, gentle air, and lack of traffic all inspired deeper breathing; we felt our long-hunched shoulders slowly drop. We wondered, though, about the elegant new bridge looming in the distance: did its presence foretell other changes? Arriving on the island, after paying $28 for a seven-day pass, we found a new rotary channeling sparse traffic, and a small, upscale beachfront retail development. But as we drove north, the landscape opened up again. Our hotel, a moderately priced, recently renovated Holiday Inn resort, sat low to the ground and back from the beach, yielding to the stunning natural landscape. One of Jekyll’s democratic appeals is its ample stock of affordable hotel rooms — the Holiday Inn, Days Inn, and Hampton Inn are all on the beach and get good reviews online. We paid extra for a suite with a kitchenette, and stocked up on groceries at the Winn-Dixie in neighboring Brunswick. Our homemade breakfasts and lunches were mightily improved by the sublime peach butter we picked up at the Commissary, a shop in the island’s historic district. We found the scenery a more sumptuous feast than the so-so dining scene — though I can fully recommend the chips and guacamole at Tortuga Jacks, along with the lively pineapple habanero IPA from Jekyll Brewing Co. (actually made in Alpharetta, Ga.). I wasn’t above trying the new Twix blizzard at the Dairy Queen, either; the island’s only fast food restaurant, it opened (presumably amid controversy) beside a new gas station in 2011. The true manmade genius of the place is the network of bike paths encircling the island, a 20-mile loop through a dazzling array of natural landscapes. Our hotel had no kids’ bikes for rent, so we hit up friendly Beachside Bike Rentals, next to the Days Inn; four bikes for four hours cost $50. We weren’t sure the girls, 7 and 9, would take to it; at home, in our hilly neighborhood, their appetite for biking is sporadic. Then the 7-year-old took an early spill, plunging the entire adventure into jeopardy; a quick first aid break at our hotel quelled the drama. The scenery grew wilder, and spurred them to keep pedaling. There were tall, delicate white birds — egrets? — in the Clam Creek marsh; a paddock full of horses at Three Oaks farm (available for sunset beach rides); and tiny, toylike private airplanes parked in the shade at the Jekyll Island Airport. We passed one of the largest live oaks in the United States (51 feet in circumference, marked with a plaque), and a sign warning golfers to watch out for alligators. Every 10 minutes or so, I spotted another moss-draped oak that simply had to be the most gorgeous yet. Every 10 minutes or so, I spotted another moss-draped oak that simply had to be the most gorgeous yet. Pausing to take photo after photo, I fell behind my family and reveled in the quiet, acutely conscious of the forest as a living presence. We encountered a few other cyclists, but almost always felt we had the island to ourselves, whether lounging by the pool or counting sand dollars on a morning beach walk. The only place we saw a crowd was at the Georgia Sea Turtle Center, the local hospital for turtles, an unexpectedly engrossing stop for animal lovers and families with children. The day we visited, researchers were inserting a tracking device in a timber rattlesnake found by a tourist on the island — a procedure we were able to watch live through a glass viewing window. To watch the sun set every evening, we crossed to the west shore, by the “sinuous, shimmering band” of marsh immortalized by Georgia-born poet Sidney Lanier in his “Hymns of the Marshes.” One night, we took in the dusky finale at Clam Creek Fishing Pier, applauding Key West-style as the fireball sank behind the bridge named for Lanier. Another evening, we ventured to tiny, walled Dubignon Cemetery, a relic of the island’s history as a family-owned plantation. As my family hid in the car from a twilight invasion of tiny biting insects, I strolled alone in the silence by the marsh’s edge, watching the sky turn dusky rose and violet. A friendly local couple, toasting the day’s end at a picnic table, welcomed me warmly, declaring it the best sunset vantage on the island. I expressed my fondness for their adopted home (like many residents, they retired there from somewhere else). They responded with a pointed question: What, exactly, did I like about it? I was startled; wasn’t it obvious, especially here, with the bronzed oaks overhead and the marsh grass lit up pinkish-gold behind us? “This,” I said, spreading my arms wide. “All this.” They nodded, satisfied and solemn. Earlier, they had attended a public meeting on island development, they said, and it had left them worried that things might change too much, driving away visitors like me. No one’s asked, but here’s my vote: Stay as you are, Jekyll Island. There is magic in those oaks — the kind that can never be recovered, once it’s gone.